This new e-book is written by Andrew S Gibson who obtained a degree in photography and has worked as Technical Editor for EOS magazine. Now he is a freelance writer making a living writing about photography. In recent years he has lived in the UK, China and New Zealand, which is now his home. In the book, Andrew shows you how to use the Library Module to import, organise and search your images. This important task lays the foundation for the work you do in Lightroom. Mastering the Library module ultimately saves you time, which you can spend either in the Develop module or with your camera. Either way, you end up with more hours to be creative. Follow this link full details of what's in Mastering Lightroom Book One and to buy your copy. 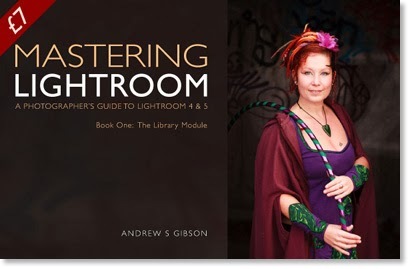 Enter the code october2 at checkout to receive a discount of £2 off the normal purchase price of £7 of Mastering Lightroom Book One: The Library Module. The discount is valid for all of Andrew's ebooks, including bundles. The code expires at midnight, 31st October 2013 GMT.